The next theatre in the series Small Towns, Big Pictures is truly a beautiful centrepiece in Moose Jaw, a small city in south central Saskatchewan. The Capitol is a crowning achievement in architecture. Designed by James McTeague in 1913 as the Monarch Theatre, the project faced financial complications during the first World War and the project was never completed. The Allen Theatre chain took over in 1916 and altered McTeague’s original design. The Grand Opening was on August 19, 1916 and was the largest theatre in Saskatchewan. 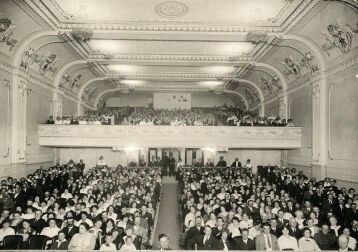 The 910-seat theatre operated under the Allen Theatre chain until 1922 when it changed its name to the Capitol. 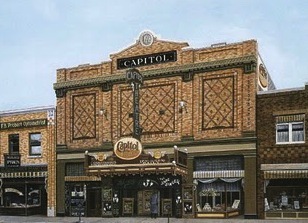 In 1929 the Capitol was renovated for sound and became Canada’s 21st theatre in the Famous Players Chain to receive Movietone and Vitaphone equipment. In 1983 it was subdivided into a 652-seat triplex and continued to operate under the Famous Players chain until its closure in August 16, 2001. The cinema is now a performing arts centre. Despite the numerous renovations and operators over the years, there was always careful consideration to protect the original interior and exterior features . The Main Street facade still retains the decorative design of the Claybank brick and inside there is an ornate plaster ceiling, quasi-classical cherubs moldings, mirrored pillars and tile floors in the lobby with marble entrance stairs and panels along the stairwells to the balcony. A must see if you happen to be traveling through Moose Jaw.